This is a post from November, 2012. Is there such a thing as too much exercise? The reason I was thinking about it is, as usual, this time of year I am noticing people getting sick. BUT, most of them are people that I would otherwise consider very health conscious. I see them regularly and know that they are exercising….A LOT. This brings me to one of my favorite lessons, the J shaped curve. We know that incorporating regular exercise into ones lifestyle is associated with a decreased incidence of upper respiratory infection when compared to leading a sedentary lifestyle. However, too much exercise at too high of an intensity can actually increase risk of respiratory infection. It does so by suppressing immune function for up to one day after the given activity. Multiple days of too strenuous activity will open up the window for illness. This is yet another reason to apply our knowledge of exercise science and proper training protocols to get the most out of it, without over-training or causing harm. In explaining this phenomenon (for lack of a better term), a J shaped curve can be observed. I have inserted a picture here that I had my daughter draw to help explain it. (It was just too good NOT to include). The Y-axis is the risk or incidence of upper respiratory infections (URI). 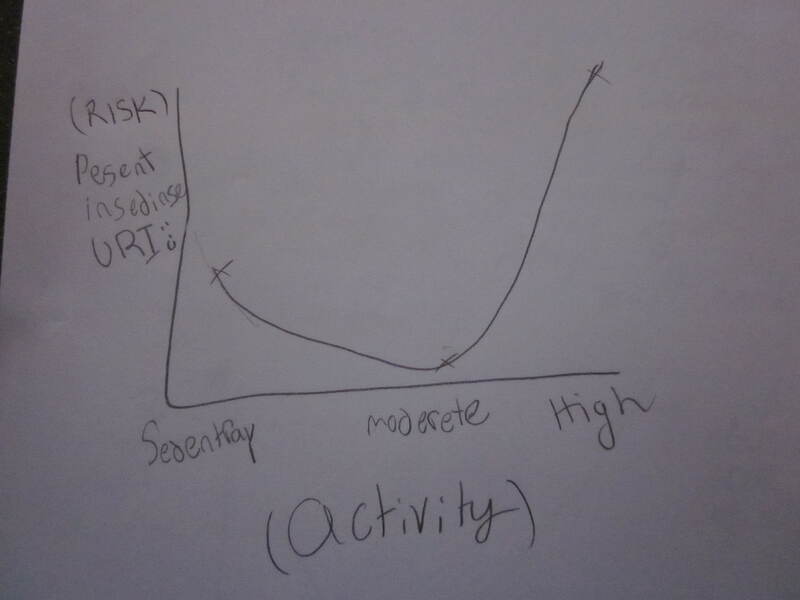 The X-axis is activity level, from low to high. A sedentary individual can expect to have an elevated risk and incidence of infection, whereas someone with a moderate activity level experiences a lowered level of risk. However, with very high levels of activity, risk begins to rise again. Given the time of year, I felt this topic was relevant. It is also a good reminder to apply proper training principles, and monitor exercise intensity, and factor in appropriate recovery – regardless of the population we are working with. We want exercise to serve as a means to improve health and performance, not impede it. Next Where Is Your Protein Coming From? Pingback: Should I Exercise With A Cold?